The businessman Giovani de Oliveira explains how fluency in English contributes to his development in his presentations of projects in events in his professional area. Presentations in international Science, technology and innovation fairs are part of Giovani de Oliveira’s life. He is an EON UPTIME former student and a managing partner in Intechno, a company that develops educational kits “to put theory into practice”, he explains. Another thing that passed from theory to practice was the English he learned at the Serra-Laranjeiras (ES) office, where the businessman studied the language for the first time in his life. “My goal was to learn English to participate in international events for my company, and be able to show our equipment with presentations and lectures”, he says. Here in Blog Up he talks about his achievement and how the fluency in the universal language enabled him to participate in events of his area. Before becoming fluent, Giovani felt uncomfortable in international fairs (where the English language was widely spoken). “I usually felt out of place. Even though the event was about a subject with which I was very familiar, it was in a language I barely knew, which was an obstacle for me in my attempts to express myself and understand others” remembers the Production Engineer. Giovani explains that he is often invited to be a speaker in international fairs in Brazil. In these fairs, he represents Intechno through devices that can optimize Engineering classes. 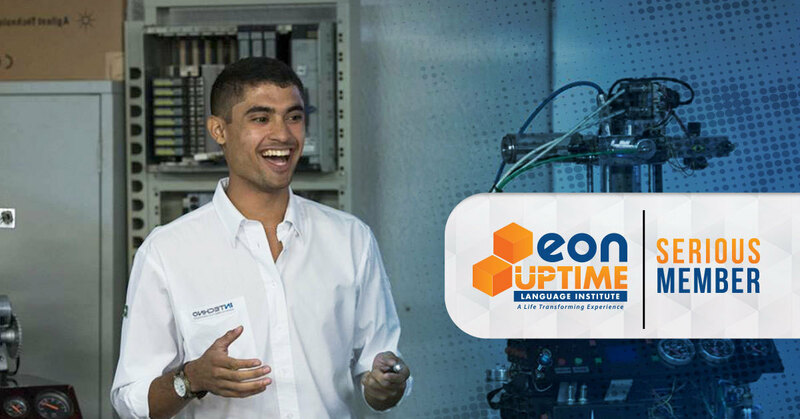 Even before concluding the Connected course, the former EON UPTIME student could already communicate in English in the events, and nowadays he prepares all his presentations in the language. When it happened here, I prepared a presentation in English for foreign Chemistry and Physics professors and it received a great number of compliments. When the event happened in Canada, one of the professors said that he found the Brazilian edition more interesting. “What made me decide to choose this institute was its teaching method and the flexible hours. I thought it was very interesting to learn English through mnemonics and neurolinguistics according to my availability”, says the businessman. Currently, in addition to the success in expositions, the businessman – who is also a mechanic and production engineer – uses his fluency in the language to answer e-mails, and talk to suppliers and clients. His plan for the future is to expand the company to other continents. In his personal life, Giovani says that he takes advantage of his fluency by watching NBA games, which he really likes. “It’s amazing to be able to understand and feel the excitement. Subtitles usually don’t translate exactly what is being said”, he concludes.